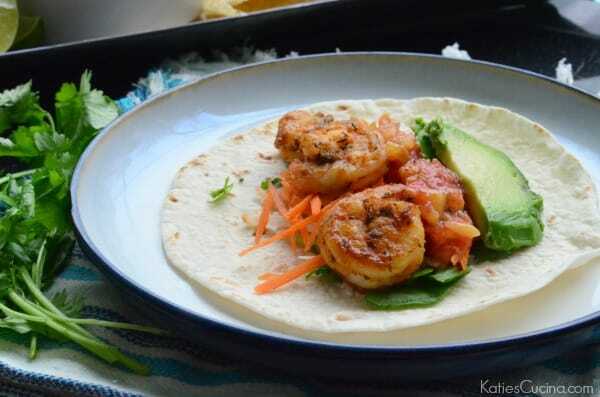 Crispy blackened shrimp completes this flour tortilla taco that has julienne sliced jicama and carrots with spinach, peach salsa, and sliced avocado! 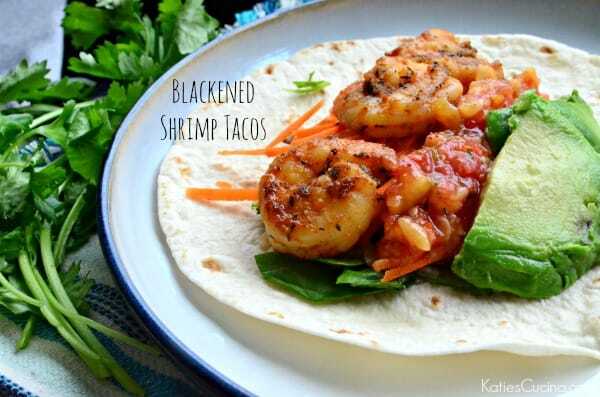 Earlier in the summer I made these Blackened shrimp tacos on a sunny afternoon for lunch. Every Sunday we go over to my inlaws house to visit with them, swim in the pool, and have dinner. It’s became part of our weekly routine. I try to bring over lunch or help with dinner where I can. I typically look around my house to figure out what I have on hand. Some weekends it’s homemade grilled flatbreads our pizza. On this particular Sunday I brought over shrimp to make tacos. I used my homemade blackening seasoning to give the shrimp a little kick. I wanted a crunch to the tacos without putting coleslaw on it. I decided to julienne cut some jicama and carrots to give it a fresh crunchy taste. 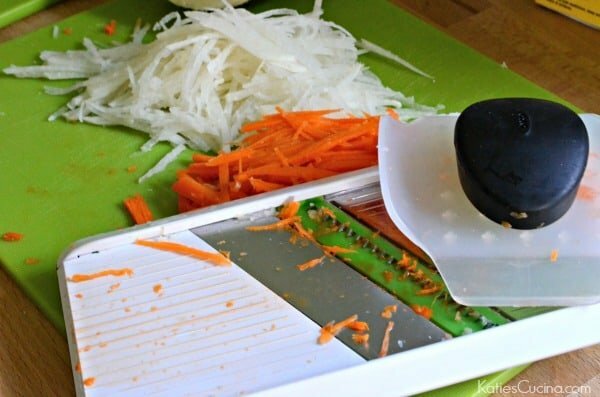 I love using the OXO Hand-held julienne slicer. It’s portable, easy-to-store, and hard root style vegetables like carrots and jicama are perfect to use on this! I also paired the blackened shrimp tacos with my homemade peach salsa. The sweet fruit paired well with the spice from the blackening seasoning pairs perfectly. It’s refreshing taco and light weight but full of flavor. 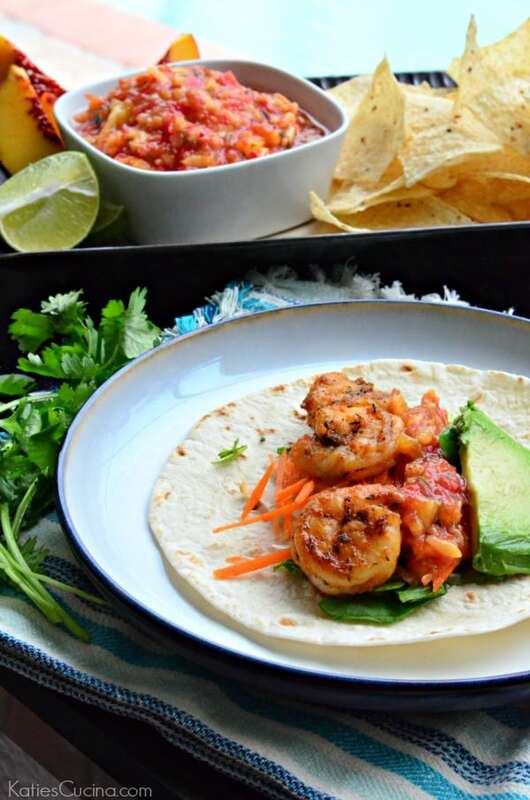 So as the weather starts to get cooler, you can dream about the hot summer days you had by eating a few of these blackened shrimp tacos! In a bowl combine, shrimp and blackening season. Heat a sauté pan on medium-high heat. Place the grape seed oil in the pan let it heat for one minute then add in the shrimp. Saute the shrimp for 3-5 minutes, stirring occasionally. Once the shrimp is pink in color, remove from the heat and set to the side. Prep all of your toppings for the taco's. Julienne slice the jicama and carrots, chop the spinach and thinly slice the avocado. Warm the flour tortillas just before serving (you can do this in the microwave in a damp paper towel for 15 seconds). 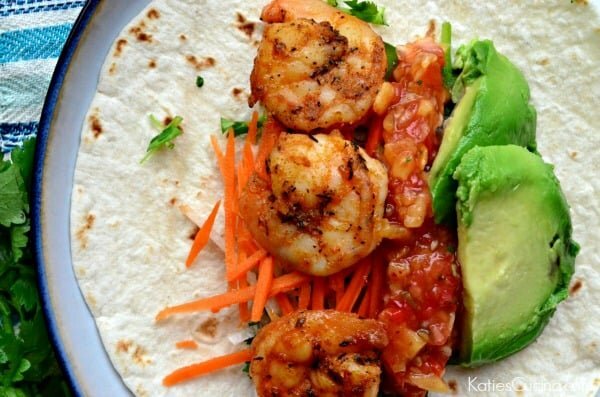 Place a flour tortilla on a plate, layer with julienne jicama and carrots, chopped spinach, 3 cooked shrimp, sliced avocado, and a tablespoon of peach salsa. Sprinkle cilantro on top if desired. Repeat until you've made all the tacos. What a wonderful daughter in law you are. How lucky your in-laws are that you are creative and wonderful cook. This recipe sure substantiates that. I would be envious, but I am blessed with two great daughter in laws myself, who are also very good cooks. You are a sweetie.